One Oklahoma company is helping to provide relief for those in pain. Delta Dental of Oklahoma has joined with other member companies of the Delta Dental Plans Association to contribute $400,000 to the America’s Dentists Care Foundation (ADCF) to expand its capability to help provide free dental care for those in need throughout the country. The American Dentists Care Foundation (ADCF) provides the portable dental equipment necessary to conduct free dental clinics across the nation. A dental “Mission of Mercy” is a two-day, free dental event where hundreds of local dental professionals volunteer their time to provide cleanings, fillings, extractions and other services to adults and children in need in their community. ADCF currently has three trailers, each containing the portable equipment required to conduct a Mission of Mercy with 100 dental chairs. In some locations, there is not enough space or volunteers to conduct a 100-unit clinic. 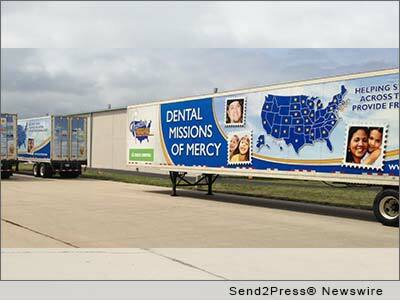 The $400,000 donation from Delta Dental member companies will be used to create a 40-chair equipment trailer, allowing for Missions of Mercy to be held in such areas. Over the past 13 years, Mission of Mercy events have helped over 135,000 patients and provided nearly $76 million in free dental care. Since 2011, Delta Dental member companies have donated $1,097,000 to ADCF for equipment to expand their capabilities. The 2014 Oklahoma Mission of Mercy was held February 7-8 at the Chisholm Trail Expo Center in Enid and provided more than $1.3 million in dental care to 1,465 patients. The Oklahoma Mission of Mercy, which is co-produced by the Oklahoma Dental Association, Oklahoma Dental Foundation and Delta Dental of Oklahoma Oral Health Foundation, is held the first weekend of each February in a different city. Delta Dental of Oklahoma is a not-for-profit corporation providing dental benefit plans to individuals, families, small businesses and Fortune 500 corporations located across the state and nation. Through its Foundation, Delta Dental of Oklahoma has contributed more than $12 million to dental health and education related programs in Oklahoma since 1998. For more information, visit http://www.deltadentalok.org/. Delta Dental Plans Association is comprised of 39 independent Delta Dental member companies operating in all 50 states, the District of Columbia and Puerto Rico. Last year, Delta Dental companies donated more than $42 million throughout the country to support programs that focus on preventing dental disease, expanding access to care, and advancing dental science. Editor’s note: a photograph of the trailer is available on Dropbox at this link: http://goo.gl/WDaUeV. For more information, contact: Debbie Anglin at Anglin Public Relations: (405) 840-4222. Original Keywords: Delta Dental of Oklahoma, America’s Dentists Care Foundation, free dental care, portable dental equipment, Mission of Mercy, corporate social responsibility, dental health and education related programs in Oklahoma Delta Dental of Oklahoma Oklahoma City Oklahoma OKLAHOMA CITY, Okla.
REFERENCES: Corporate Social Responsibility News, Delta Dental of Oklahoma, America's Dentists Care Foundation, free dental care, portable dental equipment, Mission of Mercy, corporate social responsibility, dental health and education related programs in Oklahoma Delta Dental of Oklahoma Oklahoma City Oklahoma OKLAHOMA CITY, Okla.